Tokens. A blog by Artist David Wills. : Flipfactor. Apocalypse. 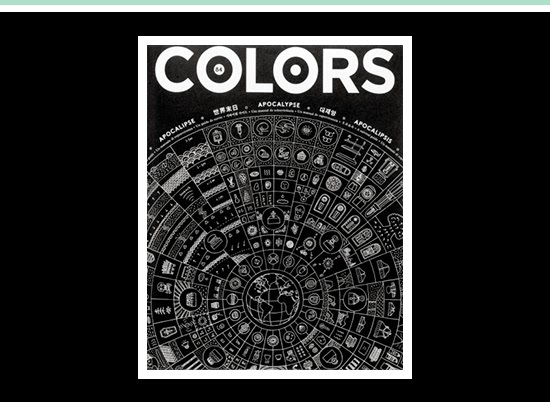 I picked up the Apocalypse back issue of Colors in Amsterdam last week, and again I was rapt as I read each story. Aside from looking fantastic with intriguing editorial content, Colors is one of the few magazines that truly covers the globe. The standout tale from this issue was one about a man called Bruce Beach. He has buried 42 old school buses in a small town, covered them with concrete and called the creation Ark Two Shelter. He'll take one thousand of the fittest people underground with him when disaster strikes to keep the human race going. Just one of many astounding stories inside.